Ovary superior with (1–)5–many locules with as many or twice as many style-branches as carpels. Fruits mostly loculicidal capsules or schizocarpic, less often indehiscent berries or samaras. Klitgård, B.B., Edwards, S.L., Biggs, N. &amp; Frisby, S. (2011). Neotropical Malvaceae (Malvoideae). Habit: shrubs, trees (herbs). Leavesalternate or two-ranked, stipulate; leaf margin toothed or entire; venationpalmate or 3-nerved. Inflorescences made up of cymose units (bicolor units, named after Theobroma cacao where it was first observed). Flowers with epicalyx present or absent; sepalaestivationvalvate; androgynophore present or absent; stamens 5-many, in five groups (fundamentally obdiplostemonous). Fruita capsule, berry, or schizocarp. Habit: herbs, shrubs or trees. Leavesalternate; simple to dissected, ovate to lanceolate or cordate; venation 3-5-nerved from the base, margins entire, crenate, or serrate; stipules present, often falling early; indumentum usually of stellate hairs or simple, glandular or lepidote hairs; sometimes with extrafloral nectaries. Flowers usually bisexual, actinomorphic, axillary or terminal, solitary or in fasciculate panicles, racemes or spikes; epicalyx present or absent; calyx of 5 sepals fused basally; corolla of 5 petals, these usually clawed, adnate to base of the stamens; stamens few to many, filaments fused into a tube; ovarysuperior, syncarpous, 1-40-locular, styles usually branched. Fruit a loculicidal capsule or schizocarp with variously ornamented mericarps, rarely a berry. Seeds solitary to numerous, pubescent or glabrous; endosperm oily. The family Malvaceae s.l. includes 243 genera, and about 4225 species and is largely tropical to temperate. Of these 129 genera and 1900-2200 species are native to the Neotropics. Subfamily Malvoideae is almost cosmopolitan with 111-115 genera and 1800-2000 species, throughout the warm temperate and temperate zones worldwide, but mostly in the New World where 78 genera and about 1200-1400 species are present. Kydia Roxb. : two species, native from Pakistan to China, but one species naturalized in South America. Abelmoschus Medik. : 15 species, endemic to the Old World, but a few species introduced and cultivated in the Neotropics. Anotea (DC.) Kunth: one species endemic to Mexico. Hibiscus L.: about 200 species almost worldwide, mostly tropical and subtropical. Kosteletzkya C. Presl: 17 species worldwide, mostly tropical America and Africa, in the New World from southern U.S.A. to Colombia and Ecuador; sometimes considered synonymous with Hibiscus. Malachra L.: eight to ten species, pantropical, but centered in northern South America. Malvaviscus Fabr. : four species from southern U.S.A. and south to Peru and Brazil. Widely naturalised worldwide. Pavonia Cav. : about 250 species, ca. 225 of these in the New World from southern U.S.A. to Argentina and in the Caribbean Islands. Peltaea (C. Presl)Standl. : 16 species, endemic to the New World, from tropical Paraguay and north to Mexico, and in the Caribbean Islands. Phragmocarpidium Krapov. : one species from central Brazil. Rojasimalva Fryxell: one species in Venezuela. Talipariti Fryxell: 22 species worldwide with some species present in Latin America; sometimes considered synonymous with Hibiscus. Urena L.: six to eight species, pantropical, some species introduced into temperate areas. Wercklea Pittier & Standl. : 13 species, endemic to the Neotropics: the Caribbean Islands, Costa Rica to Colombia and Ecuador; sometimes considered synonymous with Hibiscus. Cienfuegosia Cav. : 25 species, with subgenus Cienfuegosia in Africa and subgenus Articulata in the New World from Florida and Texas to the Caribbean Islands, and south to northern Argentina. Gossypium L.: 50 species, pantropical - subgenus Houzingenia (13 species in the Neotropics, mostly Mexico), subgenus Gossypium (14 species mainly Africa, but also Neotropics), subgenus Karpas (5 species endemic to the Neotropics); and cultivated almost worldwide. Hampea Schltdl. : 20 species, endemic to the Neotropics from Mexico to Colombia. Thespesia Sol. ex Correa: 17 species, in tropical and South Africa, Arabia, the Indian Ocean Islands, tropical Asia, Australia, the Caribbean Islands and coastlines throughout the tropics. Abutilon Mill. : about 160 species, mostly Neotropical. Acaulimalva Krapov. : 19 species, in the high Andes, from Venezuela and Colombia, to Bolivia and northwestern Argentina. Akrosida Fryxell & Fuertes: one species from Brazil. 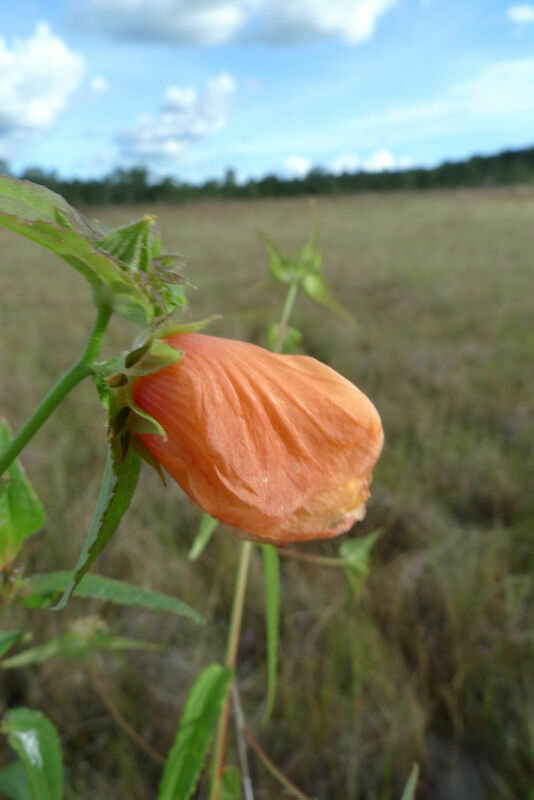 Alcea L.: about 60 species from the Middle East and southwestern Asia with one species Alcea rosea L. introduced and widely cultivated in the Neotropics. Allosidastrum (Hochr.) Krapov., Fryxell & D.M. Bates ex Fryxell: four species from Mexico and the Caribean Islands to Brazil and Bolivia. Allowissadula D.M. Bates: nine species in southern Texas and central Mexico. Andimalva J.A. Tate: four species, one from Chile, the remaining from California, Baja California, and Mexico. Anoda Cav. : 24 species, mostly Mexican, a few in the U.S.A., and one in South America. Bakeridesia Hochr. : about 20 species in Mexico and northern Central America, one disjunct in Venezuela, Colombia and Ecuador, and several in Brazil. Bastardia Kunth: three species widely scattered throughout the Neotropics. Bastardiastrum D.M. Bates: eight species in western Mexico. Bastardiopsis (K. Schum.)Hassl. : ten species from Venezuela, Colombia and Ecuador to Paraguay and Argentina. Batasimalva Fryxell: four species, three in Mexico and one in Venezuela. Billieturnera Fryxell: one species from SE Texas and NE Mexico. Bordasia Krapov. : one species from Paraguay. Briquetia Hochr. : five species from Mexico to Paraguay and Argentina. Callirhoe Nutt. : nine species from central U.S.A. to northeastern Mexico. Calyculogygas Krapov. : one species endemic to Uruguay. Calyptraemalva Krapov. : one species endemic to southern Brazil. Corynabutilon (K. Schum.) Kearney: six species from temperate Chile and Argentina. Cristaria Cav. : 74 species from Chile, southern Peru and Bolivia. Dendrosida Fryxell: seven species from Mexico, Colombia and Venezuela. Dirhamphis Krapov. : two species, one in Mexico and one in Bolivia and Paraguay. Eremalche Greene: three species, from southern California and northern Baja California. Fryxellia D.M. Bates: one species in Texas, U.S.A. and Coahuila, Mexico. Fuertesimalva Fryxell: 14 species, Andean (Venezuela to Chile and Argentina) and Mexico. Gaya Kunth: 33 species mostly from Mexico, but also in the Caribbean Islands, the U.S.A., and one in South America. Herissantia Medik. : six species from tropical America, and one species H. crispa (L.) Brizicky is pantropical. Hochneutinera Krapov. : two species, one from Mexico and one from Paraguay and Argentina. Horsfordia A. Gray: four species in Arizona and California, U.S.A. and Sonora and Baja California, Mexico. Kearnemalvastrum D.M. Bates: two species from Mexico south to Colombia. Krapovickasia Fryxell: four species, one in Texas, U.S.A. and Mexico, and three from Peru to Uruguay. Lecanophora Speg. : five species in Argentina. Lavatera L.: four species are indigenous to the offshore islands of California and Baja California. Malva L.: about 40 species in Europe, Africa, and the Middle and Far East. A few species have been introduced to the New World and have become naturalised, some as garden ornamentals, some as weeds; six species in Ecuador and Mexico. Malvastrum A. Gray: 15 species from North, Central and South America, Australia, and one species adventive elsewhere. Malvella Jaub. & Spach: four species, three in western U.S.A. and Mexico, one in Peru to Uruguay, and one disjunct in the Mediterranean. Meximalva Fryxell: two species from southern U.S.A. to central Mexico. Modiola Moench: one pantropical species. Modiolastrum K. Schum. : five species in Brazil, Paraguay, Bolivia, Argentina, and Uruguay. Monteiroa Krapov. : eight species in southern Brazil and northern Argentina. Neobaclea Hochr. : one species from Argentina. Neobrittonia Hochr. : one species from Mexico to Panama. Nototriche Turcz. : about 100 Andean species from Ecuador to Chile and Argentina. Palaua Cav. : 15 species in coastal Peru and Chile. Periptera DC. : five species in western Mexico and possibly also in Guatemala. Phymosia Ham. : eight species in Mexico and Guatemala and the Caribean Islands. Pseudabutilon R.E. Fr. : 19 species from U.S.A. to Argentina. Rhynchosida Fryxell: two species, in Texas, U.S.A., northern Mexico, Bolivia and Argentina. Robinsonella Rose & Baker f.: 15 species from Mexico to Costa Rica. Sida L.: about 100 species, pantropical, extending into temperate zones worldwide. Sidalcea A. Gray: 20 species from western U.S.A. and northwestern Mexico. Sidasodes Fryxell & Fuertes: two species from Colombia, Ecuador, and Peru. Sidastrum Baker f.: eight species from Mexico and the Caribbean Islands to Argentina. Spirabutilon Krapov. : one species from eastern Brazil. Sphaeralcea A.St.-Hil. : about 40 species disjunct between temperate North and temperate South America. Tarasa Phil. : about 30 species, mainly Andean (Peru to Argentina and Chile), with two species in Mexico. Tetrasida Ulbr. : two species from Ecuador and Peru. Wissadula Medik. : 26 species from Texas, U.S.A. to Argentina, and a few species extending to Africa. Stipules present, but often caducous. Indumentum usually of stellate hairs or simple, glandular or lepidote hairs. Fruit a loculicidal capsule or schizocarp with variously ornamented mericarps, rarely a berry. Brownlowioideae - sepals fused into a campanulate or urceolate tube; an androgynophore is always absent; stamens are many, free or fasciculate. Bombacoideae - are usually stout trees with bottle-shaped and/or trunks armed with prickles. Byttnerioideae - an epicalyx is always absent; the petals are free from the androecium; the stamens are free. Cochlospermaceae - the anthers dehisce via pores. Grewioideae - an epicalyx is always absent; the petals are usually yellow or white; the stamens are free, sometimes fasciculate. Helicteroideae - an epicalyx is always present; stamens 10-30. Sterculioideae - petals are always absent; an androgynophore is usually present; the stamen filaments are free; the ovaries are apocarpous. Turneraceae - stipules and epicalyx are always absent; two glands are often present at the leaf base; the stamens are free. In the Neotropics an epicalyx is present in 38 and absent in 46 genera. The number of styles per flower is also a good genus-level character, it varies from 1 to 45. Only 15 genera have capsules and 3 have berries; the remaining have schizocarpous fruits. The number of mericarps per schizocarp varies from 2 to 40. Abelmoschus esculentus (L.) Moench (= okra or ladies fingers) - is introduced, cultivated and used as a vegetable. Abutilon - several species are widely cultivated as ornamentals. Hibiscus - some species are ornamental e.g. H. rosa-sinensis L. and H. syriacus L.
Talipariti tiliaceum (L.) Fryxell - widely distributed along tropical shores. The past 15 years have seen an explosion in the number of phylogenetic and taxonomic studies of the core Malvales clade (e.g. La Duke & Doebley 1995; Alverson et al. 1998, 1999; Bayer et al. 1999; Baum et al. 2004; Nyffeler et al. 2005; Pfeil et al. 2005; García et al. 2009). These studies tackle the arbitrary and inconsistent delimitations among the families previously recognised within the clade. Recent outcomes of these papers include two reclassifications of the clade. One is by Bayer & Kubitzki (2002), who subsumed the previously recognized families Bombacaceae, Brownlowiaceae, Byttneriaceae, Dombeyaceae, Grewiaceae (~ more or less Sparrmanniaceae), Helicteraceae (~ more or less Durionaceae), Malvaceae s.s., Pentapetaceae, Sterculiaceae, and Tiliaceae as subfamilies under Malvaceae s.l. The other is by Cheek (2007) who recognised ten families inside the core Malvaceae clade. The APG III system (2011) adopted the subfamily approach which is also followed in this treatment. In Latin America there are representatives of the following Malvaceae subfamilies: Bombacoideae, Brownlowioideae, Byttnerioideae, Grewioideae, Helicteroideae, Malvoideae, Sterculioideae, and Tilioideae. The infrafamiliar classification adopted here follows that of Bayer & Kubitzki (2002). Malvoideae (alternatively Malvaceae) is unchanged from previous taxonomic frameworks. Alverson, W.S., Karol, K.G., Baum, D.A., Chase, M.W., Swensen, S.M., McCourt, R. & Systma, K.J. 1998. Circumscription of the Malvales and relationships to other Rosidae: Evidence from rbcL sequence data. American J. Bot. 85: 876-887. Alverson, W.S., Whitlock, B.A., Nyffeler, R., Bayer, C. & Baum, D.A. 1999. Phylogeny of core Malvales: Evidence from ndhF sequence data. American J. Bot. 86: 1474-1486. Areces B., F. & Fryxell, P.A. 2007. Malvaceae. In: Greuter, W. & Rankin R., R. (eds.). Flora de la República de Cuba, fasc. 13, pp. 1-228. A.R. Gantner Verlag KG, Ruggell. Bayer, C. 1999. The bicolour unit - homology and transformation of an inflorescence structure unique to core Malvales. Plant Syst. Evol. 214: 187-198. Bayer, C., Fay, M.F., Bruijn, A.Y. de, Savolainen, V., Morton, C.M., Kubitzki, K., Alverson, W.S. & Chase, M.W. 1999. Support for an expanded family concept of Malvaceae within a recircumscribed order Malvales: a combined analusis of plastid atpB and rbcL DNA sequences. Botanical Journal of the Linnean Society 129: 267-303. Bayer, C. & Kubitzki, K. 2002. Malvaceae: subfamily Malvoideae. In: Kubitzki, K. & Bayer, C. (eds.). The Families and Genera of Vascular Plants vol. V, pp. 277-311. Springer-Verlag, Berlin. Baum, D.A., Smith, S.D., Yen, A., Alverson, W.S., Nyffeler, R., Whitlock, B.A., & Oldham, R.L. 2004. Phylogenetic relationships of Malvatheca (Bombacoideae and Malvoideae; Malvaceae sensu lato) as inferred from plastid DNA sequences. American J. Bot. 91: 1863-1871. Bovini, M.G., Esteves, G. & Duarte, M.C. 2010. Malvaceae. In: Forzza, R.C. et al. (eds.). Catálogo de Plantas e Fungos do Brasil, pp. 1201-1227. Institúto de Pesquisas Jardím Botânico do Rio de Janeiro, Rio de Janeiro. Cheek, M.R. 2007. Malvaceae. In: Heywood, V.H., Brummitt, R.K., Culham, A & Seberg, O. (eds.). Flowering Plant Families of the World, pp. 201-202. Royal Botanic Gardens Kew, Richmond. Dorr, L.J. 2008. Malvaceae. In: Hokche, O., Berry, P.E. & Huber, O. (eds.). Nuevo Catálogo de la Flora Vascular de Venezuela, pp. 458-464. Fundación Instituto Botánico de Venezuela Dr. Tobias Lasser, Caracas. Fryxell, P.A. 1988. Malvaceae of Mexico. Systematic Botany Monographs vol. 25, pp. 522. The American Society of Plant Taxonomists, Ann Arbor. Fryxell, P.A. 1989. Malvaceae. In: Howard, R.A. (ed.). Flora of the Lesser Antilles: Leeward and Windward vol. 5, pp. 199-263. Jamaica Plain, Arnold Arboretum, Harvard University. Fryxell, P.A. 1990. Malvaceae. In: Breedlove, D.E. (ed.). Flora of Chiapas vol 3, pp. 1-90. California Academy of Sciences. Fryxell, P.A. 1992a. Malvaceae. In: Harling, G. & Andersson, L. (eds.). Flora of Ecuador 44 (118), pp. 1-141. Department of Systematic Botany, University of Gothenburg. Fryxell, P.A. 1992b. Malvaceae. In: Gomez-Pampa, A. (ed.). Flora de Veracruz, fasc. 68, pp. 1-255. Instituto de Ecología, Xalapa. Fryxell, P.A. 1993a. Malvaceae. In: Rzedowski, J. & Calderón de Rzedowski, G. Flora del Bajio y de regiones adyacentes fasc. 16, pp. 1-175. Instituto de Ecología, Xalapa. Fryxell, P.A. 1993b. Malvaceae. In: Flora del Valle de Tehuacan-Cuitcatlan fasc. 1, pp. 1-87. Universidad Nacional Autonomia de Mexico, Ciudad de Mexico. Fryxell, P.A. 1997. 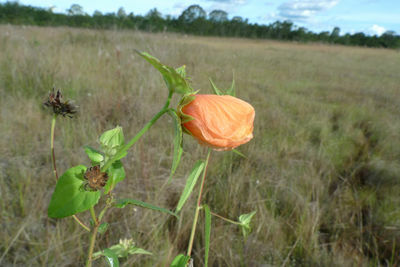 The American genera of Malvaceae II. Brittonia 49: 204-269. Fryxell, P.A. 1999. Pavonia cavanilles (Malvaceae). Flora Neotropica Monograph 76: 1-284. New York Botanical Garden Press, New York. Fryxell, P.A. 2001a. Malvaceae. In: Berry, P.E., Yatskievych, K. & Holst, B.K. (eds.). Flora of the Venezuelan Guyana vol. 6, pp. 186-219. Missouri Botanical Garden Press, St. Louis. Fryxell, P.A. 2001b. Malvaceae. In: Stevens, W.D., Ulloa U., C., Pool, A. & Montiel, O.M. (eds.). Flora de Nicaragua tomo II, pp. 1293-1322. Monographs in Systematic Botany from the Missouri Botanical Garden vol. 85. St. Louis. Fryxell, P.A. 2004. Malvaceae. In: Smith, N., Mori, S.A., Henderson, A., Stevenson, D.W. & Heald, S.V. (eds.). Flowering Plants of the Neotropics, pp. 232-235. Princeton University Press, Princeton. Fryxell, P.A. 2007. Malvaceae. In: Hammel, B.E., Grayum, M.H., Herrera, C. & Zamora, N. (eds.). Manual de Plantas de Costa Rica vol. 6, pp. 313-373. Missouri Botanical Garden Press, St. Louis. García, P.E., Schönswetter, P., Aguilar, J.F., Feliner, G.N., & Schneeweiss, G.M. 2009. Five molecular markers reveal extensive morphological homoplasy and reticulate evolution in the Malva alliance (Malvaceae). Mol. Phyl. Evol. 50: 226-239. Jørgensen, P.M. 1999. Malvaceae. In: Jørgensen, P.M. & León-Yánez, S. (eds.). Catalogue of the Vascular Plants of Ecuador, pp. 548-554. Missouri Botanical Garden Press, St. Louis. Krapovickas, A. 1965. Malvaceae. In: Cabrera, A.L. (ed.). Flora de la Província de Buenos Aires vol. 4, pp. 169-220. I.N.TA. y Facultad de Ciencias Naturales y Museo de la Universidad Nacional de La Plata, Buenos Aires. Krapovickas, A. 2008. Malvaceae. In: Zuloaga, F.O., Morrone, O. & Belgrano, M.J. (eds.). Catálogo de las Plantas Vasculares del Cono Sur vol. 3, pp. 2463-2520. Missouri Botanical Garden Press, St. Louis. La Duke, J.C. & Doebley, J. 1995. A chloroplast DNA based phylogeny of the Malvaceae. Syst. Bot. 20: 259-271. Marticorena, A. 2005. Malvaceae. In: Marticorena, C. & Rodrígues, R. (eds.). Flora de Chile vol. 2(3), pp. 22-119. Universidad de Concepción, Concepción. Nyffeler, R., Bayer, S., Alverson, S.A., Yen, A., Whitlock, B.A., Chase, M.W., Baum, D.A. 2005. Phylogenetic analysis of the Malvadendrina clade (Malvaceae s.l.) based on plastid DNA sequences. Organisms, Diversity & Evolution 5: 109-123. Pfeil, B.E., Brubaker, C.L., Craven, L.A. & Crisp, M.D. 2002. Phylogeny of Hibiscus and tribe Hibisceae (Malvaceae) using chloroplast DNA sequences of ndhF and the rpl16 intron. Syst. Bot. 27: 333-350. Pfeil, B.E. & Crisp, M.D. 2005. What to do with Hibiscus? A proposed nomenclatural resolution for a large and well known genus of Malvaceae and comments on paraphyly. Australian Syst. Bot. 18: 49-60. Pool, A. & Brako, L. 1993. Malvaceae. In: Brako, L. & Zarucchi, J.L. (eds.). Catalogue of the Flowering Plants and Gymnosperms of Peru, pp. 643-664. Monographs in Systematic Botany from the Missouri Botanical Garden vol. 45. St. Louis. Robyns, A. 1966. Malvaceae, family 115. In: Woodson, R.E. & Schery, R.W. (eds.) Flora of Panama. Ann. Missouri Bot. Gard. 52: 497-578. Stevens, P. F. (2001 onwards). Angiosperm Phylogeny Website. Version 9, June 2008 (visited 9th Feb. 2011). http://www.mobot.org/MOBOT/research/APweb/. Tate, J.A., Aguilar, J.F., Wagstaff, S.J., La Duke, J.C., Slotta, T.A.B. & Simpson, B.B. 2005. Phylogenetic relationships within the tribe Malveae (Malvaceae, subfamily Malvoideae) as inferred from ITS sequence data. American J. Bot. 92: 584-602. Klitgård, B.B. (2013). Neotropical Malvaceae (Bombacoideae). Habit: shrubs, trees (herbs). Leavesalternate or two-ranked, stipulate; leaf margin toothed or entire; venationpalmate or 3-nerved. Inflorescences made up of cymose units (bicolor units, named after Theobroma bicolor where it was first observed). Flowers with epicalyx present or absent; sepalaestivationvalvate; androgynophore present or absent; stamens 5-many, in five groups (fundamentally obdiplostemonous). Fruit a capsule, berry, schizocarp. Habit: usually trees, often buttressed and/or with a bottle-shaped trunk, and/or with chunky spines, rarely shrubs or climbers. Leavesalternate; palmately lobed or palmate, rarely simple (Matisia and Quararibea); venationpalmate or 3-nerved, margins entire, rarely dentate; stipules present, often falling early; indumentum, if present, stellate or rarely lepidote. Inflorescences of few-flowered, axillary clusters or panicles, solitary or rarely in leaf-opposing cymes. Flowersbisexual, actinomorphic; epicalyx conspicuous, of 2-3 bracts, usually present; calyx tubular, 5-lobed fused for ½ its length; corollacontorted, 5 free petals attached basally to the androecium; stamens 5 to numerous (up to 1,000), filaments fused into a tube or in antepetalous fascicles, anthers usually monothecal, straight, reniform or spirally contorted; ovarysuperior, (2-)5(-8)-locular; style with short stylar branches. Fruit a many-seeded, dehiscent, often ligneouscapsule with densely hairy endocarp (e.g. kapok) or indehiscent, juicy, 1-5-seeded drupe, rarely winged. Seeds usually glabrous, sometimes arillate or winged. The past 15 years have seen an explosion in the number phylogenetic and taxonomic studies of the core Malvales clade (e.g. La Duke & Doebley 1995; Alverson et al. 1998, 1999; Bayer et al. 1999; Baum et al. 2004; Nyffeler et al. 2005; Pfeil et al. 2005; García et al. 2009). These studies tackle the arbitrary and inconsistent limitations among the families previously recognised within the clade. Recent outcomes of these papers are two reclassifications of the clade. One is by Bayer & Kubitzki (2002) in which they subsumed the previously recognized families Bombacaceae, Brownlowiaceae, Byttneriaceae, Dombeyaceae, Grewiaceae (~ more or less Sparrmanniaceae), Helicteraceae (~ more or less Durionaceae), Malvaceae s.s., Pentapetaceae, Sterculiaceae and Tiliaceae as subfamilies under Malvaceae s.l. The other is by Cheek (2007) who recognised ten families inside the core Malvaceae clade. The APG III system (2011) adopted the subfamily approach which is also followed in this treatment. In Latin America there are representatives of the following Malvaceae subfamilies: Bombacoideae, Brownlowioideae, Byttnerioideae, Grewioideae, Helicteroideae, Malvoideae, Sterculioideae, and Tilioideae. Bombacoideae (alternatively Bombacaceae) is unchanged, except the exclusion of the Asian tribe Durioneae in the Durionaceae or Helicteroideae, and the transfer of Fremontodendron Coville and Pentaplaris L.O.Williams & Standl. from Sterculiaceae and Tiliaceae, tribe Brownlowieae, respectively. In recent phylogenetic studies, the Malvoideae is resolved as sister to the Bombacoideae with some intermediate genera (e.g. Pentaplaris and Matisia). Ceiba pentandra (L.) Gaertn. - economically important kapok producer; introduced into and cultivated in the Old World. Chiranthodendron pentadactylon (the Devil's Hand Tree) has great potential as ornamental (see http://www.strangewonderfulthings.com). Ochroma pyramidale (Cav. ex Lam.)Urb. yields the extremely light balsa wood. Phragmotheca, Matisia, Quararibea - the fruits of some species are fleshy, aromatic and edible. Patinoa spp. - the pulpy fruits are edible or used locally as fish poison. The family Malvaceae s.l. includes 243 genera and about 4,225 species which are largely tropical and temperate. Of these 129 genera and 1,900-2,200 are native to the Neotropics. Subfamily Bombacoideae is mostly present in the New World tropics and contains 27 genera (c. 250 species); a few of those genera (Adansonia L., Bombax L., Camptostemon Mast., and Lagunaria (DC.) Rchb. ), containing c. 19 species, are restricted to the Old World tropics. Aguiaria Ducke: monospecific (A. excelsa Ducke) restricted to the Brazilian Amazon. Bernoullia Oliv. : two-three species from Mexico to Colombia. Catostemma Benth. : about 10-15 species from northern South America. Cavanillesia Ruiz & Pav. : three-four species from Panama to Brazil in the East and Peru in the West. Ceiba Mill. : about 12-20 spp. from tropical America. Chiranthodendron Sessé ex Larreat. : monospecific (C. pentadactylon Larreat.) from Mexico and Guatemala. Eriotheca Schott & Endl. : about 20 species in the Neotropics. Fremontodendron Coville: two-three species from NW Mexico to adjacent SW USA. Gyranthera Pittier: two species, G. dariensis Pittier from Panama and G. caribensis Pittier from Venezuela. Huberodendron Ducke: four-five species from Costa Rica extending South to Brazil in the East and Bolivia in the West. Matisia Bonpl. : about 30 species in tropical America. Neobuchia Urb. : monospecific (N. paulinae Urb.) restricted to Haiti. Ochroma Sw.: monospecific (O. pyramidale (Cav. ex Lam.) Urb.) from tropical America. Pachira Aubl. : about 50 species (including Bombacopsis Pittier recently synonymized under Pachira), mostly neotropical, but with six species in tropical Africa. Patinoa Cuatrec. : four species from Panama through Colombia to Brazil and Peru. Pentaplaris L.O.Williams & Standl. : three species from Costa Rica, Ecuador, Bolivia, and Peru. Phragmotheca Cuatrec. : eleven species from Panama to Peru. 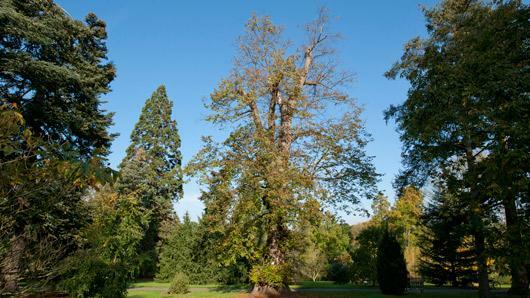 Pseudobombax Dugand: about 20 species from Mexico, through Central America to South America. Quararibea Aubl. : neotropical, more than 20 species. Scleronema Benth. : five species from Venezuela, Guyana and Brazil. Septotheca Ulbr. : monospecific, S. tessmannii Ulbr. from Peru, Colombia and Brazil. Spirotheca Ulbr. : nine species from Panama to Peru in the West and Brazil in the East. Uladendron Marc.-Berti: monospecific, U. codesuri Marc.-Berti from Venezuela. Epicalyx present, of 2-3 bracts. Petal bases adnate to the stamen tube or filaments. Stamens 5-1000, in a tube or fascicles. Anthers monothecal, straight, reniform or spirally contorted. Araliaceae - if trees, then not bottle-shaped nor with stout prickles; stipules absent; petioles often sheating the base of the leaf; flowers in umbellate units; stamens equal in number to the petals and free, anthers dithecal; fruits usually fleshy (rarely dry) drupes or berries, never with kapok. Brownlowioideae - sepals fused into a campanulate or urceolate tube; an androgynophore is always absent. Malvoideae - mostly shrubs and herbs without stout, bottle-shaped and/or prickled trunks. Byttnerioideae - sepals free; epicalyx always absent; petals cupped or hooded with strap-like appendages, free from the androecium; style unbranched. Cochlospermaceae - anthers dehiscing via pores. Convolvulaceae - stipules absent; leaves pinnately veined; stamens 5. Grewioideae - without stout, bottle-shaped or prickled trunk; epicalyx always absent; sepals free; petals usually yellow or white, often with hairy basal nectaries; stamens free, rarely fasciculate. Helicteroideae - calyx tubular; petals free and clawed; androgynophore usually present; stamens 10-30; ovaries usually apocarpous, except Ungeria and Reevesia. Sterculioideae - petals always absent; androgynophore usually present; the stamen filaments free; ovaries apocarpous. 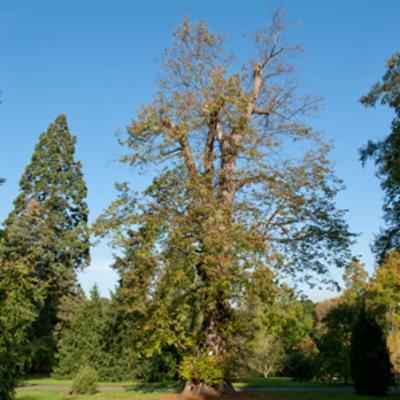 Trees, often buttressed or bottle-shaped and with or without stout prickles. Indumentum, if present, then usually of stellate, rarely lepidote trichomes. Fruit often a ligneouscapsule with hairy endocarp (kapok), or indehiscent, juicy drupe, rarely winged. Alverson, W.S. 1999. Bombacaceae. In: Jørgensen, P.M. & León-Yánez, S. (eds.). Catalogue of the Vascular Plants of Ecuador, pp. 326-329. Missouri Botanical Garden Press, St. Louis. Alverson, W.S. 2004. Bombacaceae. In: Smith, N., Mori, S.A., Henderson, A., Stevenson, D.W. & Heald, S.V. (eds.). Flowering Plants of the Neotropics, pp. 55-58. Princeton University Press, Princeton. Alverson, W.S. & Steyermark, J.A. 1997. Bombacaceae. In: Berry, P.E., Holst, B.K. & Yatskievych, K. (eds.). Flora of the Venezuelan Guyana vol. 3, pp. 496-527. Missouri Botanical Garden, St. Louis. Alverson, W.S. & Mori, S.A 2002. Bombacaceae. In: S.A. Mori, G. Cremers, C.A. Gracie, J.-J. de Granville, S.V. Heald, M. Hoff & J.D. Mitchell (eds.). Guide to the Vascular Plants of Central French Guiana, pp. 139-145. Memoirs of the New York Botanical Garden 76, part 2. New York Botanical Garden Press. Bayer, C. 1999. The bicolor unit - homology and transformation of an inflorescence structure unique to core Malvales. Plant Syst. Evol. 214: 187-198. Bayer, C. & Kubitzki, K. 2002. 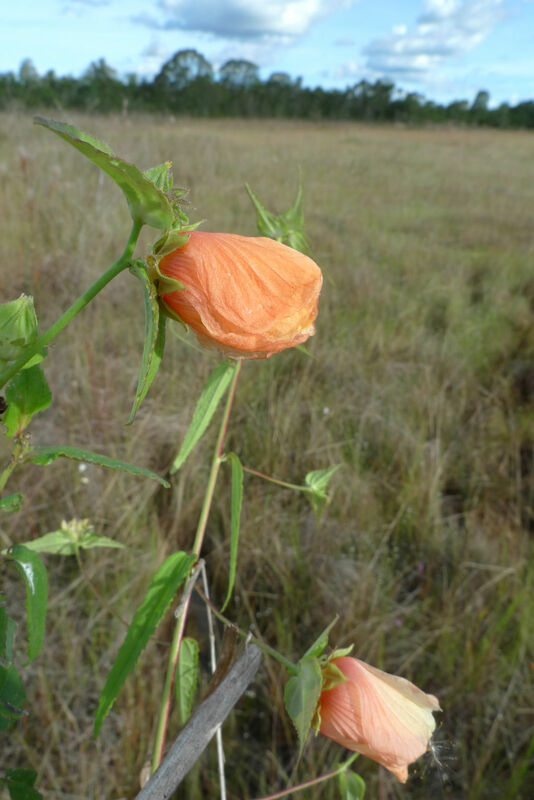 Malvaceae: subfamily Bombacoideae. In: Kubitzki, K. & Bayer, C. (eds.). The Families and Genera of Vascular Plants vol. V, pp. 277-311. Springer-Verlag, Berlin. Bornstein, A.J. 1989. Bombacaceae. In: Howard, R.A. (ed.). Flora of the Lesser Antilles: Leeward and Windward vol. 5, pp. 263-272. Jamaica Plain, Arnold Arboretum, Harvard University. Brako, L. & Alverson, W.S. 1993. Bombacaceae. In: Brako, L. & Zarucchi, J.L. (eds.). Catalogue of the Flowering Plants and Gymnosperms of Peru, pp. 213-216. Monographs in Systematic Botany from the Missouri Botanical Garden vol. 45. St. Louis. Cheek, M.R. 2007. Malvaceae. In: Heywood, V.H., Brummitt, R.K., Culham, A & Seberg, O. (eds.). Flowering Plant Families of the World, pp. 65. Royal Botanic Gardens Kew, Richmond. Carranza G., E. & Blanco G., A. 2000. Bombacaceae. In: Rzedowski, J. & Calderón de Rzedowski, G. Flora del Bajio y de regiones adyacentes fasc. 90, pp. 1-16. Instituto de Ecología, Xalapa. Gentry, A.H. & Alverson, W.S. 2001. Bombacaceae. In: Stevens, W.D., Ulloa U., C., Pool, A. & Montiel, O.M. (eds.). Flora de Nicaragua tomo I, pp. 430-435. Monographs in Systematic Botany from the Missouri Botanical Garden vol. 85. St. Louis. Jansen-Jacobs, M.J. 1986. Bombacaceae. In: Stoffers, A.L. & Lindeman, J.C. (eds.). Flora of Suriname III(1-2), pp. 277-282. E.J. Brill, Leiden. La Duke, J.C. & Doebley, J. 1995. A chloroplast DNA based phylogeny of the Malvaceae. Systematic Botany 20: 259-271. Robyns, A. 1964. Bombacaceae, family 116. In: Woodson, R.E. & Schery, R.W. (eds.) Flora of Panama. Ann. Missouri Bot. Gard. 51: 37-68. Stevens, P. F. (2001 onwards). Angiosperm Phylogeny Website. Version 12, July 2012 (visited 18th Jan. 2013). http://www.mobot.org/MOBOT/research/APweb/. Zuloaga, F.O., Morrone, O. & Belgrano, M.J. 2008. Bombacaceae. In: Zuloaga, F.O., Morrone, O. & Belgrano, M.J. (eds.). Catálogo de las Plantas Vasculares del Cono Sur vol. 3, pp. 1627-1631. Missouri Botanical Garden Press, St. Louis. Klitgård, B.B. (2013). Neotropical Malvaceae (Byttnerioideae). Habit: shrubs, trees (herbs). Leavesalternate or two-ranked, stipulate; leaf margin toothed or entire; venationpalmate or 3-nerved. Inflorescences made up of cymose units (bicolor units, named after Theobroma bicolor where it was first observed). Flowers with epicalyx present or absent; sepalaestivationvalvate; androgynophore present or absent; stamens 5-many, in five groups (fundamentally obdiplostemonous). Fruita capsule, berry, schizocarp. Habit: usually small shrubs, less often trees, lianas or herbs; bark highly fibrous. Leavesalternate or two-ranked; simple, rarely palmate (Herrania); venationpalmate or 3-nerved, margins often serrate; stipules present, often falling early; indumentum, if present, stellate. Inflorescencesaxillary, leaf-opposed or rarely terminal thyrses, sometimes reduced to solitary flowers or cauliflorous fascicles (Theobroma and Herrania). Flowersbisexual, actinomorphic; epicalyx usually absent; calyx of 5 sepals fused for less than ½ their length; corolla of 5 free petals, these often cupped or hooded and with a strap-like appendage, basally free from the androecium, sometimes completely reduced (species of Hermannia, Melochia, Waltheria); androgynophore absent; stamens 5 to 10, rarely more, fused into short tube or fascicles, anthers usually dithecal, rarely trithecal; ovarysuperior, (1-3)5-locular; stylesimple. Fruit a many-seeded, indehiscent, fleshyberry, dehiscentcapsule or schizocarp with 1-many-seeded mericarps. Seeds usually glabrous, sometimes arillate or pubescent. The past 15 years have seen an explosion in the number of phylogenetic and taxonomic studies of the core Malvales clade (e.g. La Duke & Doebley 1995; Alverson et al. 1998, 1999; Bayer et al. 1999; Baum et al. 2004; Nyffeler et al. 2005; Pfeil et al. 2005; García et al. 2009). These studies tackle the arbitrary and inconsistent delimitations among the families previously recognised within the clade. Recent outcomes of these papers include two reclassifications of the clade. One is by Bayer & Kubitzki (2002), who subsumed the previously recognized families Bombacaceae, Brownlowiaceae, Byttneriaceae, Dombeyaceae, Grewiaceae (~ more or less Sparrmanniaceae), Helicteraceae (~ more or less Durionaceae), Malvaceae s.s., Pentapetaceae, Sterculiaceae and Tiliaceae as subfamilies under Malvaceae s.l. The other is by Cheek (2007) who recognised ten families inside the core Malvaceae clade. The APG III system (2011) adopted the subfamily approach which is also followed in this treatment. In Latin America there are representatives of the following Malvaceae subfamilies: Bombacoideae, Brownlowioideae, Byttnerioideae, Grewioideae, Helicteroideae, Malvoideae, Sterculioideae, and Tilioideae. The infrafamiliar classification adopted here follows that of Bayer & Kubitzki (2002). Byttnerioideae (alternatively Byttneriaceae): its members were formerly included in the Sterculiaceae, but molecular, morphological (presence of cupped petals and absence of androgynophore) and biogeographic data joined these genera and resolved Grewioideae as its sister, thus separating them from the reduced Sterculiaceae/Sterculioideae. Herrania lemniscata (Schomb.) R.E.Schult. the sweet-sour pulp around the seeds is edible, tasting similar to Theobroma pulp (Millken & Albert 1999). 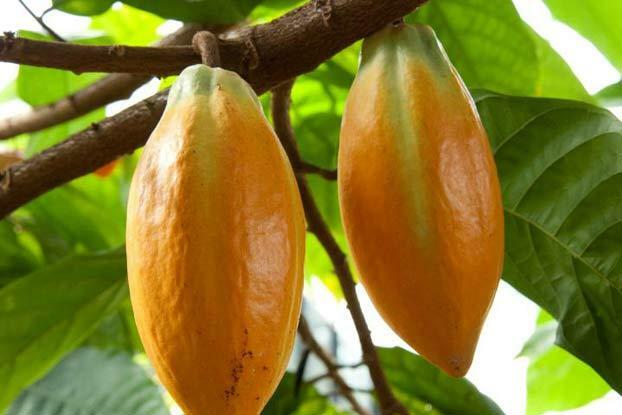 Theobroma cacao and relatives are used to make chocolate. Chocolate is more than just a delicacy: evidence suggests that eating between 46 and 105g of chocolate a day can have a moderate effect on lowering blood pressure (Ried et al. 2012). Cocoa has also been used for an array of medicinal purposes. 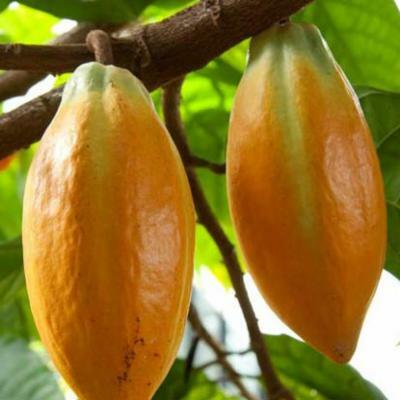 Unfermented cocoa seeds and the seed coat are used to treat a variety of ailments, including diabetes, digestive and chest complaints. Cocoa powder, prepared from fermented cocoa beans, is used to prevent heart disease. Cocoa butter is taken to lower cholesterol levels, although its efficacy is unclear. It is also used widely in foods and pharmaceutical preparations, as well as being used as a rich moisturiser for the skin. The crushed shells of cocoa beans are used as an alternative to peat mulch. Mulches are layered on to the soil surface to suppress weeds, conserve moisture, improve its visual appearance and minimize erosion. Not only does this make good use of cocoa-shell, which is a by-product of the chocolate industry, but it also helps reduce the use of peat. For further information see http://www.kew.org/plants-fungi/Theobroma-cacao.htm. Subfamily Byttnerioideae is pan- and subtropical and consists of 27 genera and c. 650 species; widely distributed in Africa and Latin America with eight genera and 280-300 species in the Neotropics. About half the genera are restricted to Australasia. Some groups are mainly found in humid tropical forest, while others are restricted to drier habitats. Ayenia L.: about 70 species from southern North America to Argentina. Byttneria Loefl. : pantropical with more than 130 species, about 80 of which are neotropical. Guazuma Mill. : three species from Mexico to NE Argentina and West Indies. Herrania Goudot: about 17 species in tropical Central and South America. Melochia L.: less than 50 species, mostly neotropical, a few in the Palaeotropics - some widely distributed weeds (Chocolate weed - M. corchorifolia L). Rayleya Cristóbal: one species (R. bahiensis Cristóbal) from Brazil. Theobroma L.: 22 species - in tropical rain forests of Central and South America. Waltheria L.: about 50 to 60 species, mostly neotropical with centres of diversity in Mexico and Brazil (W. indica L. native to the New World, but a pantropical weed). Usually small shrubs, less often trees, lianas or herbs. Indumentum, if present, usually of stellate, rarely lepidote trichomes. Stamens antepetalous, 5-10, solitary or in groups of 2-3(-6) with the filaments fused within groups. Fruit a berry, capsule, rarely schizocarp. Leaves simple (except palmate in Herrania). Stipules present, but often early caducous. Leaves often distichous with plagiotropic branching. Petals usually cupped or hooded, often with apical appendage. Brownlowioideae - sepals fused into a campanulate or urceolate tube; stamens many, free or fasciculate. Bombacoideae - usually stout trees with bottle-shaped and/or trunks armed with prickles; leaves usually palmate/palmately lobed; sepals fused into a tube; petals adnate to androecium; style branched. Cochlospermaceae - anthers dehisce via pores. Grewioideae - petals usually yellow or white, clawed, often with hairy basal nectaries; stamens numerous, free, sometimes grouped in antesepalous fascicles. Helicteroideae - calyx tubular; epicalyx always present; petals clawed; androgynophore usually present; stamens 10-30; ovaries usually apocarpous, except Ungeria and Reevesia. Malvoideae - epicalyx is present in ½ and absent in ½ the Neotropical genera; petals adnate to the androecium; stamens fused into a staminal column. Sterculioideae - petals always absent; androgynophore usually present; stamen filaments free; ovaries apocarpous. Bayer, C. & Kubitzki, K. 2002. 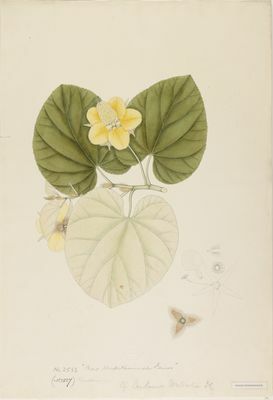 Malvaceae, Byttnerioideae. In: K. Kubitzki, & C. Bayer (eds). The Families and Genera of Vascular Plants vol. V, pp. 241-247. Springer-Verlag, Berlin. Bornstein, A.J. 1989. Sterculiaceae. In: Howard, R.A. (ed.). Flora of the Lesser Antilles: Leeward and Windward vol. 5, pp. 272-292. Jamaica Plain, Arnold Arboretum, Harvard University. Cheek, M.R. 2007. Byttneriaceae, p. 76. In: V.H. Heywood, R.K. Brummitt, A. Culham, & 0. Seberg (eds). Flowering Plant Families of the World, pp. 241-247. Royal Botanic Gardens, Kew. Cristóbal, C.L. 1960. Revisión del género "Ayenia". Opera Lilloana 4: 1-230. Cristóbal, C.L. 1976. Estudio taxonomico del genero Byttneria Loefling (Sterculiaceae). Bonplandia 4: 3-428. Cristóbal, C.L. 1981. Rayleya, nueva Sterculiaceae de Bahia - Brasil. Bonplandia 5: 43-50. Cristobal, C.L. 1998. Sterculiaceae fam. 178. In: Hunziker, A.T. (ed.). Flora fanerogamica Argentina. Fasciculo 57, 32pp. Proflora, Cordoba. Cristóbal, C.L. 2001. Sterculiaceae. In: Stevens, W.D., Ulloa U., C., Pool, A. & Montiel, O.M. (eds.). Flora de Nicaragua tomo III, pp. 2428-2437. Monographs in Systematic Botany from the Missouri Botanical Garden vol. 85. St. Louis. Cristóbal, C.L. 2007. Sterculiaceae de Paraguay, I. Ayenia, Byttneria, Guazuma, Helicteres, Melochia y Sterculia. Bonplandia 16(1-2): 5-142. Cristóbal, C.L., Saunders, J.G., & Berry, P.E. 2005. Sterculiaceae. In: Berry, P.E., Holst, B.K. & Yatskievych, K. (eds.). Flora of the Venezuelan Guyana vol. 9, pp. 248-280. Missouri Botanical Garden, St. Louis. Cristóbal, C.L. & Saunders, J.G. 2008. Sterculiaceae. In: Zuloaga, F.O., Morrone, O. & Belgrano, M.J. (eds.). Catálogo de las Plantas Vasculares del Cono Sur vol. 3, pp. 3055-3064. Missouri Botanical Garden Press, St. Louis. Door, L.J. 2002. Sterculiaceae. In: S.A. Mori, G. Cremers, C.A. Gracie, J.-J. de Granville, S.V. Heald, M. Hoff & J.D. Mitchell (eds.). Guide to the Vascular Plants of Central French Guiana, pp. 700-706. Memoirs of the New York Botanical Garden 76, part 2. New York Botanical Garden Press. Door, L.J. & Fryxell, P.A. 1999. Sterculiaceae. In: Jørgensen, P.M. & León-Yánez, S. (eds.). Catalogue of the Vascular Plants of Ecuador, pp. 918-922. Missouri Botanical Garden Press, St. Louis. Fryxell, P.A. 2004. Sterculiaceae. In: N. Smith, S.A. Mori, A. Henderson D.W. Stevenson & S.V. Heald (eds). Flowering Plants of the Neotropics, pp. 360-362. Princeton University Press, Princeton. Goldberg, A. 1967. The genus Melochia (Sterculiaceae). Contr. U.S. Nat. Herb. 34(5): 191-363. Merello, M.C., Cristóbal, C.L. & Dorr, L.J. 1993. Sterculiaceae. In: Brako, L. & Zarucchi, J.L. (eds.). Catalogue of the Flowering Plants and Gymnosperms of Peru, pp. 1137-1142. Monographs in Systematic Botany from the Missouri Botanical Garden vol. 45. St. Louis. Milliken, W. & Albert, B. 1999. Yanomami: A Forest People. Royal Botanic Gardens, Kew. Ried K, Sullivan TR, Fakler P, Frank OR, Stocks NP. 2012. Effect of cocoa on blood pressure. Cochrane Database of Systematic Reviews Issue 8. Art. No. : CD008893. DOI: 10.1002/14651858.CD008893.pub2. Rose, J.N. 1897. A Synopsis of the American Species of Hermannia. Contrib. US National Herbarium 5(3): 130-131. Ruiz, E. 2005. Sterculiaceae. In: Marticorena, C. & Rodrígues, R. (eds.). Flora de Chile vol. 2(3), pp. 20-21. Universidad de Concepción, Concepción. Robyns, A. & Cuatrecasas. 1964. Sterculiaceae, family 117. In: Woodson, R.E. & Schery, R.W. (eds.) Flora of Panama part VI. Ann. Missouri Bot. Gard. 51: 69-107. Rondon, J.B., Cumana C., L.J. 2005. Revision taxonomica del genero Theobroma (Sterculiaceae) en Venezuela. Acta Bot. Venezuel. 28: 113-133. Saunders, J.G. 1993. Four new distylous species of Waltheria (Sterculiaceae) and a key to the Mexican and Central American species and species groups. Syst. Bot. 18: 356-376. Saunders, J.G. 1995. Systematics and Evolution of Waltheria (Sterculiaceae-Hermannieae). Ph.D. diss. The University of Texas at Austin. 854 pp. Saunders, J. G. 2005. New species of Waltheria (Hermannieae, Byttnerioideae, Malvaceae) from Paraguay, Argentina, and Venezuela, and two new records for Paraguay. Darwiniana 43(1-4): 201-211. Silva, C.R.S. & Figueira, A. 2005. Phylogenetic analysis of Theobroma (Sterculiaceae) based on Kunitz like trypsin inhibitor sequences. Plant Systematics & Evolution 250: 93-104. Stevens, P. F. (2001 onwards). Angiosperm Phylogeny Website. Version 9, June 2008 (visited 6th Feb. 2013). http://www.mobot.org/MOBOT/research/APweb/. Whitlock, B.A. & Baum, D.A. 1999. Phylogenetic relationships of Theobroma and Herrania (Sterculiaceae) based on sequences of the nuclear gene vicilin. Systematic Botany 24(2): 12-138. Whitlock, B.A., Bayer, C. & Baum, D.A. 2001. Phylogenetic Relationships and Floral Evolution of the Byttnerioideae ("Sterculiaceae" or Malvaceae s.l.) Based on Sequences of the chloroplast Gene, ndhF. Systematic Botany 26(2): 420-437. Whitlock, B.A. & Hale, A.M. 2011. The Phylogeny of Ayenia, Byttneria, and Rayleya (Malvaceae s.l.) and Its Implications for the Evolution of Growth Forms. Systematic Botany 36(1): 129-136. Corolla imbricate, with 5 free often clawed petals, or (genera 1–6) flowers unisexual, perianth uniseriate, the perianth 5-lobed, valvate. Androgynophore well-developed, inconspicuous or absent. Androecium uniseriate, stamens (4–)5–20, all fertile or with some filiform staminodes, the filaments united into a long or short tube, or free or, (genera 1–6) anthers subsessile in a ± globose head on an androgynophore; less usually androecium biseriate, the inner whorl being staminodes, usually petaloid, the outer whorl fertile. Anthers dithecal, dehiscing by slits, rarely by apical pores, extrorse. Seeds 1-numerous, rarely winged or arillate, endosperm present or absent, cotyledons flat or folded, thin or fleshy. Many species are cultivated as ornamentals or for fibres and as vegetables.